After three days on Lil' House. From left: Roger, Michael and Nate. Lil' House comes to life! It's taken a couple years of stop-and-go tinkering, but our lil' house on the Mousam is now habitable. It's certainly still a work-in-progress, but she's turning into a cool little hangout in the woods. 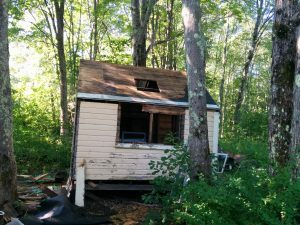 When we bought our home, it came with this tiny, turn-of-the-century cottage on the back of the lot, in the woods. Mostly, the cottage was slowly rotting away and turning to mulch. Rotting trim and broken windows were letting rain and snow slowly decay the floorboards in the back left corner, and the cool brick chimney (boarded up) leaked, further compounding the problems. But it had charm. Originally towed from some property in Wells sometime in the mid- or late-80s, the cottage sat precariously balanced on the two pressure-treated 4x4s used as a sled for transport. Under those beams were three old-style railroad ties. Back in 2013, Nate and I spent a day moving and leveling the cottage, then I used plastic sheeting to help slow the onslaught of water damage. But every time I went inside, I was turned away by the sheer magnitude of the interior project, the desire not to spend money on a tiny shack, and confusion about handling the built-in cabinetry. Do I try to salvage and reinstall it? Do I just toss it? In early summer 2015, at a time when I needed to swing a hammer at something, I took a sledge hammer to the interior walls of Lil' House and attempted to pull the cabinetry without damaging it. 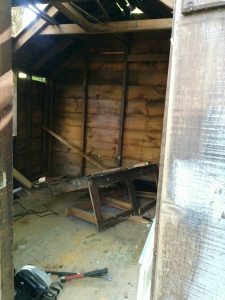 I half succeeded, put all the woodwork under a big tarp, loaded up all the debris for the dump, then let the house sit for another year. Interior of Lil' House. Gutted. Skylight openings cut. 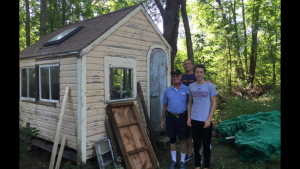 Then in August, my son Nate, my father-in-law Roger, and I got a bit busy on the cottage. 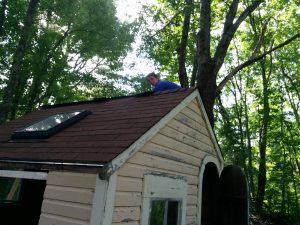 We stripped the moss-encrusted, leaking asphalt roof, found two cheap skylights at the Habitat for Humanity Re-store store and some shingles. 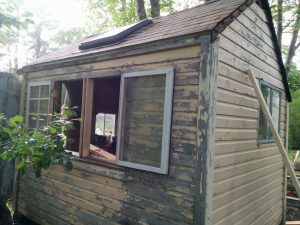 We cut two 2'x2' holes in the roof, installed the skylights, and re-roofed Lil' House. Nate took a small sledge to the chimney, which we removed. Old windows are out, rotting wood is being cut away, old roof is on the tarp, skylight holes are in, and chimney hole (on left) is covered. I had been collecting old, vertical sash windows from the side of the road for a couple years, knowing that I did NOT want to spend much money on this project. I mostly hoarded them in Lil' House, waiting for the day when I would actually put some windows in. But salvaged windows aren't uniform, and they typically don't match. We made the best of it by greatly expanding the glass area of the house. Including the skylights, there is easily more than 24 square feet of glass in this tiny, 10x9 cottage. We kept just one window - itself a replacement, vertical-sash frame from an old double-hung - and put in four additional, fairly large windows. Two open in, suspended from the rafters. Two open out. And one is fixed. Skylights are in, shingles are on. All that's left is the ridge cap. 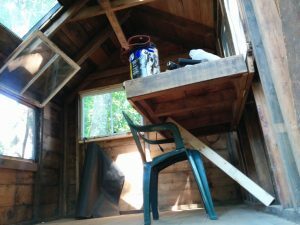 I salvaged screen material and built fixed screens for the windows that open. Where Lil' House was once a dark, dank shack with low ceilings, boarded up, missing, and broken windows, she is now a small room with tons of light, a breeze, and a view of the woods. It made little sense to try to reinstall the built-in cabinet: it took up about 25% of the square footage and a good portion of the wood was damaged in the removal. Instead, I committed to re-using it where I could. It became exterior trim board, replacement sill plating and structural beams, and more. And I decided to use the biggest "counter" piece to make a built-in, drop-down desk/table. While the desktop is way overbuilt, coming in around 50 pounds, it gives me a good feeling to keep it. It folds down and out of the way, helping to maximize the 90 square feet of floor space, but then it pops right back up to become a five-foot-long desktop. Looking in on Lil' House from the front door, floor view. Notice all the light. Next came some wiring. There's nothing fancy here because I'm delivering power via extension cord. I picked up a couple interior wall sconces and wired them together and to a plug. I even found a free front porch light that I mounted right outside. I had picked up a stereo receiver/tuner and a CD changer from the transfer station Treasure Chest a couple months ago. And last year I picked up a couple bookshelf Realistic speakers at Treasure Chest. I built a small shelf in the corner and above the desk, where I put the stereo system. I mounted the speakers up in the peak. This little cottage is coming along! View from the back side, with outward swinging windows. Much of the site is still a construction zone, with tools in boxes in the cottage and piles of debris scattered about. And she still looks just awful from the exterior because I need to get busy on some sanding and painting. She's all trimmed up on the outside now, though I still need to replace a couple rotting trim boards around the doorway. But this Lil' House is now a legitimate cottage. I could bring a cot out and easily use it as a three-season shelter.